The Secret Almond Mission was my newest and (weirdest?) project yet. 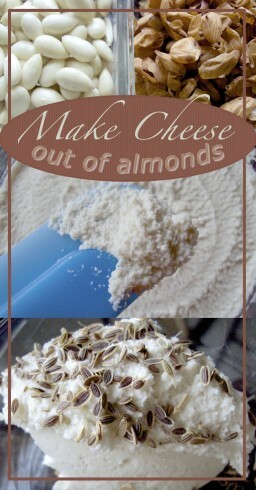 I turned Almonds into Cheese. The first step was to soak the almonds for 12-24 hours, and then take the skins off. See the result here. The second step was to blend the almonds in the blender with 1 clove of garlic, a few turns of the Himalayan salt grinder, repeated with the pepper grinder, and enough water to blend. Next, I added 1 packet of probiotics and stirred it in (for some reason I feel like I would have killed the bacteria if I blended it—I don’t know if that’s true or not!). This phase is kind of smooshy and not delicious looking! 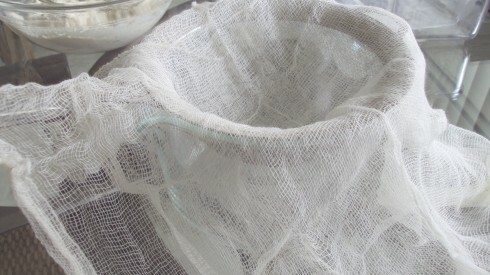 Step 3 was to line a mesh strainer with cheesecloth, put the goop into it, and put something heavy on it to press out the liquid. 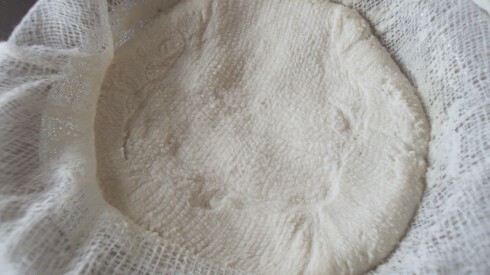 The pic above is before I covered it with the cheese cloth and pressed out the liquid. The pic below is after the liquid drained out through the strainer into the container beneath it. After this contraption sat on the counter for 12-16 hours, I dumped it out of the cheesecloth into a dish, spread it around…and tasted it. 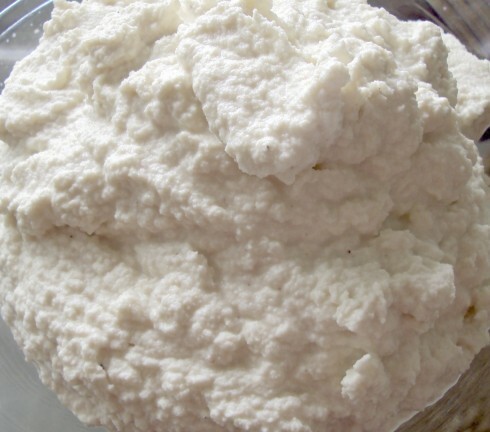 I know it looks lumpy, but the texture is very light and fluffy—almost like whipped butter, but just a little denser. Maybe like whipped cream cheese? 1. 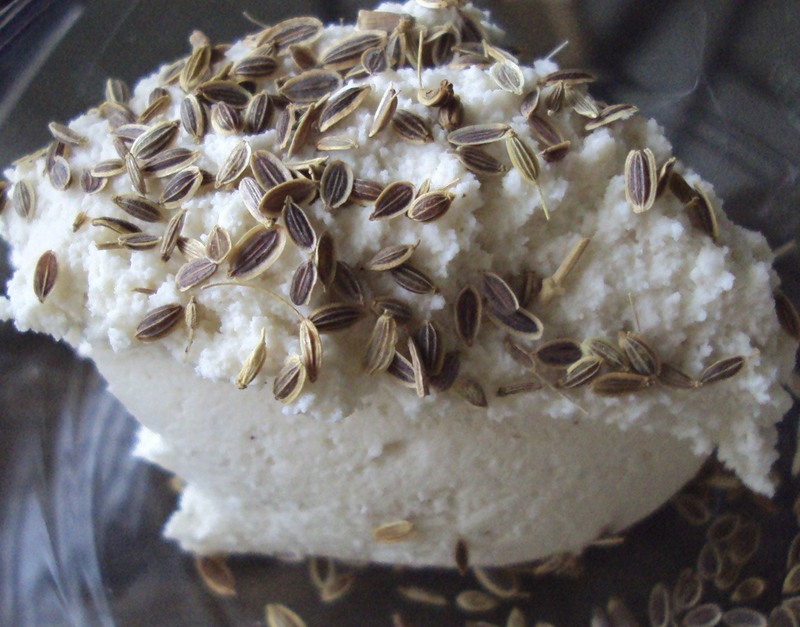 I like the idea of having cultured nut cheese instead of dairy because I like variety, and I like to make cheesy stuff for my vegan and dairy sensitive friends! 2. It tasted good, except one thing—I only had lemon-flavored probiotics and took a chance that the cheese would have a creamy lemon flavor. It did. That background taste was slightly….weird. Next time, I would be sure to use plain probiotics. 3. I tasted it on celery—yum! I tasted it on a cucumber slice—yum! I ate a spoonful of it—yum!. I thought adding different herbs and stuff might add some variety in flavor, so I dumped some dried dill seeds on a scoop of it (because I’m impulsive and that’s what I had within reach!). This was great! 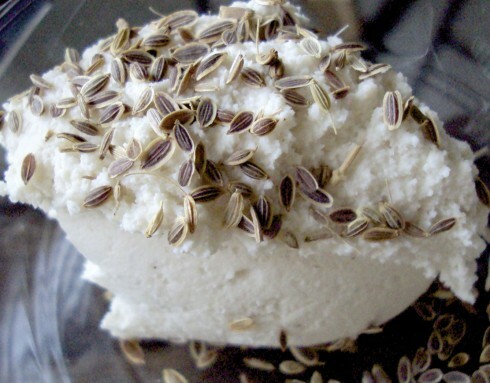 Guilt-free, plant-based, probiotic cheese!! I’d also like to attempt one that’s more like Dr-Cow’s cheese, where it is aged (or probably pressed) to the point of being slice-able. What would you add to your cheese? I have to try to make nut cheese. I think I should really benefit from some added probiotics in my diet, but the powdered soy milk yogurt I tried to make the other day turned-out to be a disaster! I guess I would have more luck with your recipe. It truly looks delicious! I love cheese and cheese spreads, but since I try to avoid dairy products, it's been a while since I haven't ate some. Do you think it could work with a regular blender and not just with a vitamix? I think the cheese would work with an un-vitamix blender…the only issue might be that you will probably need to nudge the goop a little bit to blend all the way—-I had to with the vitamix too…but it has that handy tamper thing that goes through the top with no worry of it being chopped by the blades. You may just have to add a little more water, which is ok because it will drain out later. You could probably put the nuts in a food processor (or even put them in a bag and pound on them with a hammer) to start out with smaller pieces to blend. As I was blending, I wondered if it would be just as good in the food processor. I'll experiment and let you know! 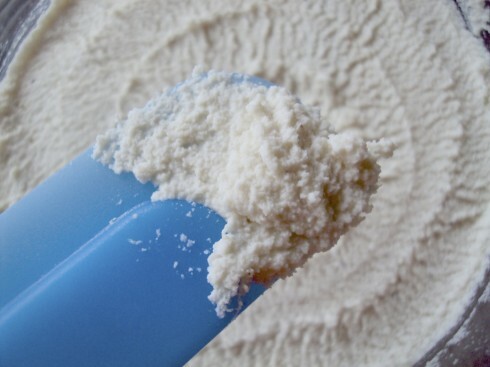 I'm going to try a few different combinations of ingredients—I liked what I did, but I think I would just like a little more depth or something to the flavor (and of course, plain probiotics). 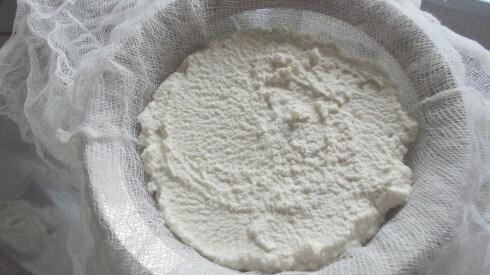 I'm going to be making coconut water kefir and coconut meat cheese very soon too. I don't know if the cheese will turn out more like yogurt, but I'll be sure to post! That looks very exciting! Maybe with some additional pressure and time it will turn into more of a sliceable cheese? And I'd try adding all sorts of things… from basil to tomatoes to onion and garlic and wow my head swims with so many options. Looks great! Do you think I could do it with yogurt culture/is that the same as probiotics? I know where to get yogurt culture! If the yogurt culture/starter has any dairy in it (or if it's made with milk or dairy), it may not work. I read something about how the dairy based ones wouldn't work as well in either nuts or coconuts. I don't think that means it definitely won't work…but it isn't likely to work as well. If you try it, let me know how it turns out! If I find out any other ideas for how to do it without probiotics, I'll let you know. 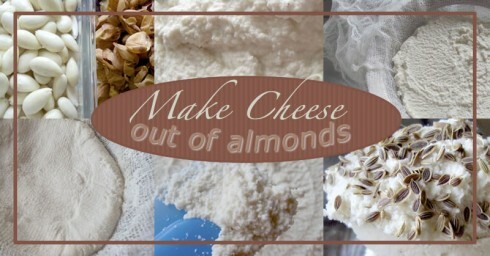 Pingback: Master of the Almond Cheese! Previous post: What Is This and What Am I Doing With It?